A classical DC Motor has only two connections and, when connected to a power supply, will continuously spin. On the other hand, a servo motor operates completely different. It is formed of four parts: a DC motor, a gear reduction unit, a position-sensing device (usually a potentiometer), and a control circuit. The servo receives a control signal that represents a desired output position of the servo shaft, and applies power to its DC motor until its shaft turns to that position. The shaft typically does not rotate freely round and round like a DC motor, but rather can only turn approximately 180 degrees back and forth. The servo has a 3 wire connection: power, ground, and control. The power source must be constantly applied; the servo has its own drive electronics that draw current from the power lead to drive the motor. The servo is controlled through pulse width modulation (PWM), which means that a signal which is ON only for a certain amount of time is applied, as seen in Figure 1. The duration of the positive-going pulse (time in which the signal is ON) determines the position of the servo shaft. That means, the angle is determined by the duration of a pulse that is applied to the control wire, as seen in Figure 2. The signal has a repetition time of 20ms and the duration of the ON signal is between 1ms and 2ms. A duration of 1.5ms is usually referred to as the neutral or central position (90 degree). A longer pulse makes the servo turn to a clockwise-from-center position, and a shorter pulse makes the servo turn to a counter-clockwise-from-center position. When these servos are commanded to move they will move to the position and hold that position. If an external force pushes against the servo while the servo is holding a position, the servo will resist from moving out of that position. Servos will not hold their position forever though; the position pulse must be repeated to instruct the servo to stay in position. 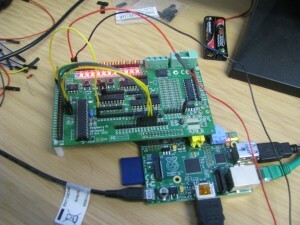 The Gertboard is an add-on GPIO expansion board for the Raspberry Pi computer. It comes with a large variety of components, including buttons, LEDs, A/D and D/A converters, a motor controller, and an Atmel AVR microcontroller. In order to get the Gertboard powered from the Pi a jumper needs to be installed between the top two pins of the jumper J7 (located in the bottom right part of the Gertboard), as seen in Figure 3. The motor controller on the Gertboard can only be used to power a DC Motor, for a servo we will need to use the Atmel AVR microcontroller to produce the control signal for the servo. To do this, we will setup the Gertboard such that the microcontroller can be programmed through the Arduino IDE. The Gertboard can hold an Atmel AVR microcontroller, a 28-pin ATmega device, at location U8 on the lower left of the board. This is usually either the ATmega 168A/PA or 328/P in a 28-pin DIP package. All input/output pins are brought out to header J25 on the left edge of the board. There is a separate 6-pin header (J23 on the left side of the board) that can be used to program the device. Note that the ATmega device on the Gertboard operates at 3.3Volts. That is in contrast to the ‘Arduino’ system which runs at 5V. Warning: many of the Arduino example sketches (programs) mention +5V as part of the circuit. Because we are running at 3.3V, you must use 3.3V instead of 5V wherever the latter is mentioned. If you use 5V you risk damaging the chip. Initialising a new ATmega microcontroller for use with the Gertboard. Looks all OK - Happy ATmega programming! Once this is all done, the connections seen in Figure 4 need to be done on the Gertboard to prepare it for programming the ATmega chip. → BUF1 at the top left of the Gertboard connected to the control signal (yellow wire) of the servo. Also you will need power from the power supply to go into the red (middle) cable of the servo and GND from the power supply into the brown cable (GND) of the servo. //Do we need to change direction? 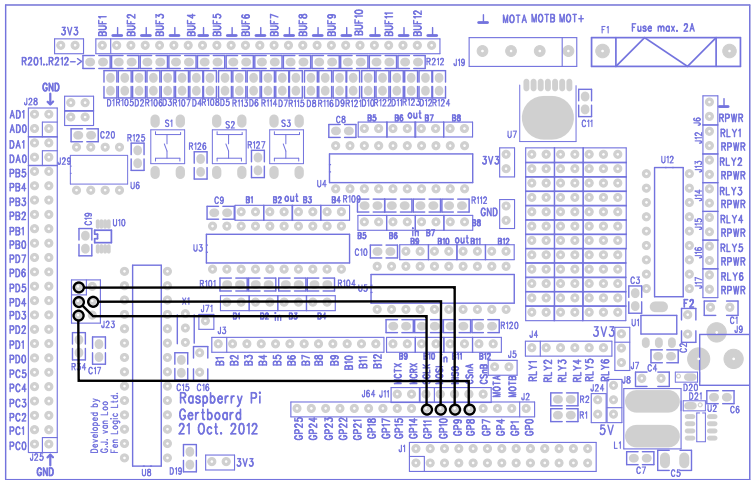 Upload it onto the ATmega: File → Upload Using Programmer. Once the file uploads successfully, ensure that all the connections are in place, power the servo from a battery or from a power supply with approximately 6V (if using a power supply you will also need to adjust the current until the servo moves as programmed). Now that you have everything set up, the motor should spin approximately 180 degrees back and forth. to open up the serial port. It’s defaulted to 9600 baud, but that should be fine for most of the demo sketches. for other Linux distributions you may need to check the permissions and ownership of the /dev/ttyAMA0 device and adjust accordingly. The following code will now use the Servo and Serial libraries from Arduino to control the servos, so copy and paste it into a new Arduino sketch. Most of the connections from the previous program are made, just that this time we will not be using pin 13 (PB5) but pin 9 (PB1). So if you had the connections done for the previous program, move the jumper on PB5 to PB1 (it will still connect onto Buffer 1). Also, you will need to add two jumpers, one between GP14 on J2 and MCRX and the second one between GP15 on J2 and MCTX, as shown in Figure 6 below. 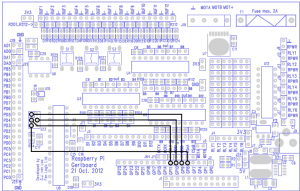 This connections are necessary to connect the ATmega chip’s UART pins to the Raspberry Pi, in order to ensure the two can receive and transmit. MCTX and MCRX are Transmit and Receive respectively. Now that all connections are done, and ensuring that the servos are both powered you can upload the code using File → Upload Using Programmer. Having the serial port open in a terminal with minicom as described above, you can now give commands to either of the two servos. Note that initially the two servos are in the neutral position (90 degrees) as initialized in Setup(). For example, by typing l60 you are commanding the motor attached to pin 9 to move at the 60degrees position. By typing r120 the motor attached to pin 10 should move to the 120degrees position. First, a voltage divider is created using a photoresistor and a normal resistor. In the configuration that we will use (Figure 7), the voltage at the output (Vout) will increase with light exposure. This happens because the voltage across the photoresistor decreases (due to resistance decreasing) and this means more voltage will drop across resistor R.
An analog input from the Gertboard is connected to Vout such that the change in Vout will be read as a signal between 0 (meaning 0Volts) and 1023 (+3.3V for the Gertboard), according to how much light strikes across the photoresistor. This signal level will then be mapped into a value for the angle of movement of the servo (between 0 and 180 degrees) and that value is written to the servo by using a digital pin, as we did earlier. See how the servo moves according to the amount of light across it, by restricting the light with your hand or by using a flash-light/lamp. Using two photoresistors can make the servo follow the flashlight, as per the video: http://www.youtube.com/watch?v=iEhX27ahreI. 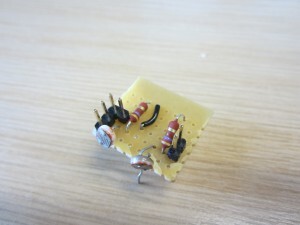 The small circuit has been built on a small piece of stripboard, as shown in Figure 8 below. This can be attached onto the servo such that the servo follows the flashlight quite precisely. The connections that need to be done are: pins PC1 and PC0 on the Gertboard (analog pins 1 and 0) connected to the headers as per Figure 8, digital pin PB1 on the Gertboard (pin 9) to the control signal of the servo and all the power and GND connections. Note that in Figure 8 there are three GND connections because it is easier to connect all grounds onto the same place on the stripboard. If the connections are not clear, see the diagram at http://stigern.net/blog/?p=103 for a more detailed diagram, where you need to replace the connections on the Arduino with the ones on the Gertboard. Then you need to upload the following code on the Atmega and you should have a working lighttracker. int pos = 0; // Variable to store the servo position. int inputPhotoLeft = 1; // Easier to read, instead of just 1 or 0.
int Left = 0; // Store readings from the photoresistors. int Right = 0; // Store readings from the photoresistors. myservo.attach(9); // Attach servo to pin 9. // Reads the values from the photoresistors to the Left and Right variables. // Checks if right is greater than left, if so move to right. // +20 is the deadzone, so it wont jiggle back and forth. // Checks if left is greater than right, if so move to left. // Added some delay, increase or decrease if you want less or more speed. © 2019 Raspberry Pi Development Notes.